Events like those of Tuesday, September 11, while certainly heart-wrenching and terribly tragic from a human standpoint, always have great potential for good. I’m sure the world will see much good coming from these circumstances in the days and years ahead. That good will include the healing of the gaping, bleeding wounds individuals, groups, and nations have inflicted upon one another and themselves. I’ve already seen positive changes in people’s behavior — I’m sure many of you have too. However, on Tuesday, virtually every driver I encountered on the highway was driving sensibly — and, remarkably, most were observing the speed limits. It felt like nearly everyone had a renewed reverence for life. After I got home, I went out jogging, as I do most afternoons. Many people in the neighborhood had come home early from work. Schools had closed early. Folks were gathered in the streets talking in hushed tones, some with their children. Many, I’m sure, were talking to neighbors who’d been strangers until Tuesday. Around here, people can live next door to each other for years, and never be friends, or even speak to one another. But now people seemed hungry to connect with their sisters and brothers in a deeper, more loving way. Life, in one unbelievably harsh moment, had suddenly become precious again. On Tuesday, at least, there were no strangers next door. If any of you were personally affected by Tuesday’s attacks, or if any of your loved ones were, my heart goes out to you. We send you, and everyone on this mailing list, our love and our support. We are grateful your lives have touched ours. The following is a long question one of our newsletter readers sent us after the September 11th events. After the question is Spirit’s response. “I’m not sure how you choose your question of the week or month to answer, but I have a question. Please excuse the lengthiness, but I’m not sure how else to verbalize this. “It’s well known that many of us have been dealing with effects of post-traumatic stress and sorrow since the events of September 11th, whether or not we were directly affected. For myself, I know that on that day my heart chakra was opened up much wider and I am much more emotional now, which is not a bad thing! “However, my sorrow and pain run so deep now and I find it difficult sometimes to deal with the world. “I read something today where it was said that, with the whole world looking on that day, we now have those horrific images permanently etched in our third eye. I immediately burst into tears upon reading this — it felt like an epiphany for me. It rang true, and real. “I do feel like my third eye is scarred, injured in some way. Whatever positive feelings I have, positive steps I take, hours of meditation I do, that sorrow is there, etched in. “I guess my question is, if one ascribes to that belief — that those images have been etched into the third eye — what can be done to overcome that? This seems to me to be something on a psychic and spiritual level, needing a psychic and spiritual healing. Am I way off base? The events of September 11 were a grand opportunity and opening for many of you. We do not mean to dismiss the human suffering and sadness that day brought forth. But, for there to be a healing, the healing you ask for, you must look at the events of that fateful day from a higher perspective. And so let us do so. Because when your emotions open up, you are more deeply connected to your higher self, your soul. Your emotions are an extraordinarily powerful means of communication between you and your soul. In very simple terms, when you feel good, you’re aligned with your soul. When you feel bad, you’re not. “Look, my beloved one whom I love and adore, you’re moving away from me. You’re alienating yourself from the joy and bliss I exist in eternally. You don’t have to do that. I want to be deeply, intimately connected to you always, and in all ways. “Together we can work magic. We can work miracles. We can create all your dreams and desires. Even your wildest, most passionate dreams and desires. We can manifest all of everything you’ve ever wanted in this lifetime. You can have it all! That is what your souls are saying to you. Yes, “that sorrow is there.” But it is not “etched in” permanently. It remains there only as long as you give it your attention, your focus. If you completely withdraw your attention and focus, then — for you — it ceases to exist. It really is that simple. Granted, it’s not always easy, especially given your world’s penchant for dwelling on pain and sorrow. But the world’s way is not your way unless you choose to be among the sheep who follow instead of being the shepherd who leads. Even if the whole world diverges from you, you can still be the shepherd who leads, the one who leads the way for you. You are, in fact, the only one who can ever lead the way on the path that is absolutely, exquisitely perfect for you. No one else can do it for you. And so let us return to your point about sorrow being etched into your third eye. Certainly none of you who are deeply sensitive to vibrations, as most of you are, can remain unmoved or unfeeling about 9/11. But the feelings you have experienced can be launching pads for whatever you wish to create next in your lives. Yes, you are surely free to dwell on the past and relive those painful moments. But you are equally free to take your focus elsewhere. And to put it on what you want to create for yourself in the days and years ahead. This is all about focus. With your laser-like focus, you can create miracles. Or you can create disasters. It’s up to you. You are the creator of it all. Do not allow yourself to be swayed and seduced by the world “out there.” Your world today seems to live for titillating tales of drama and disaster. And so it creates more of the same, by its focus. But you, even if you are marching to the beat of a drummer totally alien to the rest of the planet, can create for yourself heaven on earth. The entire world could be going to hell, and you could be living in paradise on earth. You are not shackled or imprisoned by the past, even the recent past, unless you believe you are. Your third eye is not “scarred.” You are not crippled. Except if you believe you are. Whatever you believe, you will create experiences to confirm your belief. It’s not the other way around. If you believe you are totally free (and you truly are), you can and will create the glorious and joyful life you want for yourself. You do that by giving your attention to what you want. And by not giving your attention to what you do not want. It’s pretty simple. The “psychic and spiritual healing” you ask for is already yours. Remember — “Ask and you shall receive.” But you can’t claim the healing by dwelling on your pain. You claim it and make it fully yours by dwelling on the glory and grandeur you, at the soul level, are. Then you are healed. John, As a participant in the search and rescue efforts at Ground Zero, the sights, sounds and emotions of those terrible times stay with me. 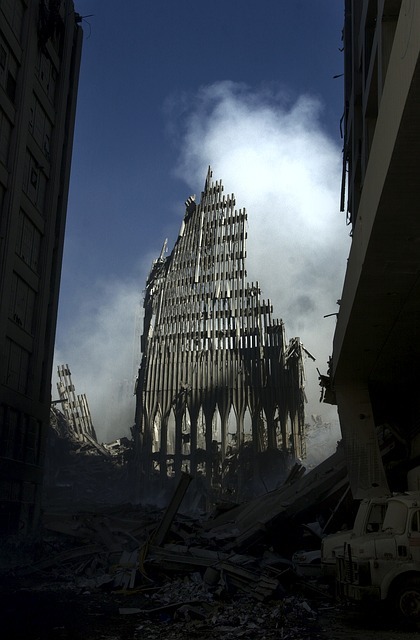 It is the annual “celebration” of 9/11/01 that dredges up the old sorrows. I am clear about the opening of the heart that I experienced back then as well as continued experiences to this day. The “Never Forget” motto attached to 9/11 is understandable and serves to remember and honor those souls lost on that day — as well as those we continue to lose fourteen years later because of 9/11 but it should not serve to maintain a war-like attitude for revenge and vengeance. I am, however, hopeful and I know that Mankind is moving forward toward our Ascension so let’s put the dirt behind us and move on. Thanks so much, Tom, for your beautiful, compassionate comments. As someone who was there during those difficult days, I’m sure you have a much greater understanding and perspective than the rest of us. Thank you again for sharing. I love your final words, and I echo them—I am, however, hopeful and I know that Mankind is moving forward toward our Ascension so let’s put the dirt behind us and move on. Your article has brought me much personal benefit and has reminded me of my power to move forward and to forget past hurts. I feel happier to celebrate today. Thank you! Thanks very much, Marie, for your kind comments, and for sharing your experiences. I’m delighted the article helped. I totally agree with what Tom said. I wonder if Spirit would say something similar about the refugee “crisis” in Europe. Thank you, Pat. I don’t know what Spirit would say about the refugee crisis. Maybe I’ll ask. I totally remember the day of 9/11. The supreme sorrow deep within for those lost and all of the families, all that gave all they had to help in any way they could, and the suffering that followed. I remember the tears that wouldn’t stop, and I distinctly remember the sorrow I felt for the kind of life the perpetrators must have experienced to hold the viciousness, hatred, and belief that this was a good thing. They also gave their lives. It was difficult to find the positive, the potential goodness. We have now had the opportunity to do so. We need not linger in that point of time, and we need not totally understand what was given nor lost. We do need to see the changes within ourselves. As you say, we’ve moved on—and now have the opportunity to see the positives resulting from this sad event. And, as you so wisely put it, we need to see the changes in ourselves. Spectacular, thanks so much for sharing such a fundamental reminder, in such a beautiful way.. Really needed it! You’re most welcome, Tom! I’m glad it was helpful.